Posted in Diet & Nutrition on August 2, 2011. Last modified on February 01, 2018. Read disclaimer. Despite discouraging studies recently, connecting potato consumption with an increased risk for developing type 2 diabetes, insulin resistance and weight gain, the news is not all bad for our beloved spud. When you consider the many ways they can be eaten: chips, French fries, mashed, baked, hash-browned and boiled, Americans consume far more potatoes than any other vegetable; an average of 130 pounds per person annually (40 pounds more than the second most popular vegetable, tomatoes). So, when Harvard University researchers reported that potatoes are so high in simple carbs that their consumption may increase a person's risk of developing type 2 diabetes and insulin resistance, it was a huge disappointment to many health-conscious consumers. As a double whammy, Harvard also announced that an extra serving of potatoes is more likely to make a person gain weight than if they consume an extra serving of red or processed meat or drink an extra 12oz soda daily. The good news, according to the US Department of Agriculture, is that it IS possible to incorporate potatoes into a healthy diet. Just replace common, white potato varieties with less common but more nutritious, exciting, and deeply colored, red, orange and purple potato breeds. Potatoes originated from the Andes region of South America and were originally found in many colors. The people of the region still cultivate and eat a variety of colorful potatoes. Since the potato was introduced to North America, however, we've been genetically selecting for higher starch content. Along the way, the potato has gradually lost its color to become what we now know as the white baking potato. This is the potato used for mashed potatoes, baked potatoes, and French fries in most prepared food. The color of a vegetable or starch is indicative of its carotenoid (orange color found in carrots, sweet potatoes, etc.) or flavonoid content, both of which may offer health benefits including cancer-protective compounds. While regular potatoes contain vitamin C, folic acid, iron and potassium, deeply colored potatoes provide much higher levels of antioxidants such as zeaxanthin and lutein, carotenoids and some provide flavonoids. And, because some of the colorful breeds of potatoes are naturally smaller in size, they also have a higher skin to starch ratio (you find most of a potato's nutrients right below the skin). Charles R. Brown, an agricultural research geneticist at the USDA has cross-bred colorful potatoes that may be the future of the potato. Brown has made dozens of breeding crosses to examine additional health benefits in colored varieties. "The pigments that produce the colors may also function as antioxidants in the human diet," Brown says. Antioxidants may aid in preventing certain cancers and types of blindness, as well as improving cardiovascular health. Brown has also developed an orange potato that has up to four times the antioxidants zeaxanthin and lutein as white potatoes. In blind taste tests, people preferred the flavor of Brown's orange potatoes to currently available white varieties. While Charles Brown's research potatoes are not yet available, it is becoming far more common to find traditional colored potatoes at supermarkets, farmers markets, and in seed catalogs (if you have an interest in gardening). In its annual survey of fruits and vegetables with the highest pesticide residue, the Environment Working Group (EWG) lists potatoes at number 9 in their list of the dirty dozen. Though the survey does not differentiate boutique potatoes, such as the ones discussed here, from standard varieties, you may want to purchase organically grown colorful potatoes if available. Most pesticide residue is on the skin and, since that is the most nutritious part, you may not want to peel any more of your potatoes. So, go ahead and enjoy a baked purple potato or red potato fries or chips (substitute olive oil for other fats and go light on the salt). Since the starch content of colorful potatoes is the same as standard varieties, consider "stretching" your mashed potatoes or potato salad with other nutrient-dense foods like garlic, parsley, olive oil, onions, tomato, hard boiled eggs, or yogurt. Potatoes are delicious and easy to get kids to eat in a variety of ways. 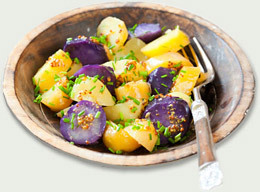 Yes, you can "have fries with that" when you eat colored potatoes. Potatoes can take a long time to bake so I love cutting them into the shape of fries, tossing them in olive oil with crushed garlic, sprinkling with Italian seasoning (or even just salt and pepper), placing them on foil and baking them for 30 minutes in our countertop convection oven. They get crisp on the outside and stay moist inside... everyone loves them. I've grown regular potatoes in the garden by planting sections with eyes and I've had good enough luck. Since the organic purple potatoes at the health food grocery store are so expensive, this year I tried doing the same with purple potatoes. They developed great eyes but I probably left them under the counter a couple months too long because the potatoes were pretty shriveled by the time I sectioned and planted them. They never even broke through the ground. After a couple weeks, I dug up the plot and couldn't find any sign of the sections I'd planted and I could find no sign of them; they had just disintegrated! So, I THINK you can start the expensive purple potatoes just like regular potatoes but next year, I will make sure to get them in the ground while they are still nice and firm. I don't know if it would have helped save your over-developed starter potatoes but I've read that you have less chance of rot if you plant the whole spud rather than sectioning it. Obviously, the downside is that you get fewer plants from each starter potato.